Every few years, we can count on hearing social commentary on the alleged erosion of American values. Predictably, marriage is part of the discussion, and inevitably, the American divorce rate is cited as a cause for concern. The figure usually cited is that 50% of marriages in the U.S. end in divorce, although the true figure is somewhere between 40% and 50% overall, with higher rates among couples who married at younger ages and lower rates for couples who married at older ages. The usual trajectory of this discussion is for someone to claim that we have made divorce “too easy,” that marriages are viewed as throwaway commodities, and that the whole mess started in the 1970s when American states began to adopt no fault statutes. Prior to that time, one spouse had to claim total innocence in the marital breakdown while proving “fault” by the other party in one of several designated categories – typically adultery, desertion, or physical or mental cruelty. This proof was a painful and distasteful process, and it could both lengthen the divorce process and make it more expensive. The adoption of no fault provisions made it possible for one party to obtain a divorce by alleging a ground such as “irretrievable breakdown” of the marriage without specifically attributing the blame to either partner. Since U.S. divorce rates peaked in the early 1980s after the adoption of no-fault laws, social critics periodically argue that we should return to fault-based statutes to make divorce hard to obtain. A recent article in The New York Times discusses the current situation in England, which still has a system that requires proof of fault to obtain a divorce. It is a good reminder of where we Americans were a couple of decades ago, and it should serve as a cautionary tale about the consequences of returning to a fault-only divorce system. As was true here in former times, English divorce cases require couples to prove the fault of one spouse, and unless it is a case of provable adultery or desertion, they are left with a broad category called “unreasonable behavior,” which is roughly equivalent to “mental cruelty” under American statutes. The article cites examples of allegations in recent English cases: a husband who required his wife to dress in a Klingon costume, the husband who refused to share the TV remote control, and the wife who threw away her husband’s favorite cold cuts. These examples allowed us morning newspaper readers to have a chuckle, but I doubt that they are funny to the couples involved, nor to the judges who must juggle overcrowded dockets to listen to these pleas. As the English judges observed, a fault system requires people to bring their squabbles into court and publicly accuse and humiliate each other. If they are already suffering from the decline and end of their marriage, what possible justification is there for making them suffer more? In fact there is little proof for the claim that the advent of no fault divorce “caused” more people to get divorced in the United States. The divorce rate increased at a time when there were other huge changes in American society: more women in the workforce, fewer children per family, longer lifespans, and greater expectations about marriage providing happiness and fulfillment. Lifelong marriage meant something different in 1900 when women had no other means of support and the average life expectancy was around 50. The fact that people now marry more for love than for economic security may in fact demonstrate greater respect for marriage, even if people leave their marriages at somewhat higher rates than in bygone times. Anyway, the low likelihood of obtaining a formal divorce did not stop people from simply leaving their spouses or having affairs: both behaviors are as old as marriage itself. There was also a dark side to fault-only divorce. Remaining in marriages until one had incontrovertible proof of a spouse’s fault could be very unpleasant and sometimes dangerous. Illinois was one of the last states to adopt no fault grounds, and I cringe when l think about my Illinois bar review teacher summarizing that state’s rule at the time. “Remember,” he said,” in Illinois the rule is that to obtain a divorce, the wife has to prove two beatings and that her husband had time to cool off in between.” What happened to those women who stuck around for that second beating? People do not leave their marriages casually, and divorce is hard enough without making it harder. The English experience should remind us of how far we have come, and encourage us to stay the course by continuing to allow couples to end their marriages with less accusation and less humiliation within a no-fault system. Those who want to eliminate no-fault divorce have rocks in their heads. The idea that we should make it harder for people to divorce is the product of those who live in fantasy lands. Worse yet, it is another intrusion by government into the private and personal lives of people. The idea that divorce is “easy” is likewise the product of lazy minds who have never actually gone through the process. It is anything but easy. Having experienced divorce as both a child and a parent, I agree with what I take to be the major undertakings of this post. First, divorce is not “easy” in the sense that it is not a wrenching experience for those who go through it. Second, chasing after legal regulation of the reasons for marital dissolution is a fool’s game. As a conservative and (mostly) libertarian, the idea that government could manage domestic relations strikes me as a horrow show. But still … while I agree that there were social forces that lead to the movement for no fault divorce, I think that the accomplishment of that legal objective also substantially undermined social sanctions against divorce. Law and culture interact with each other in an iterative process. And the outcome matters. Higher rates of divorce and of non-marital parenting have adverse consequences on children. There is very little that social science proves, but the evidence on that is overwhelming. So what to do? This may be an area where my ideological confreres may have to appreciate what we know to be true in other contexts and rightly criticize the left for too often failing to appreciate. “Government” is not “society” and to fail to insist that something not be advanced by government compulsion (in this case, a strong presumption against divorce) is not equivalent to opposing it. But there are all sorts of iterations in between. I wonder. Is there an inconsistency between the law’s strong presumption that both partners contribute equally to the economic circumstances of a marital couple and the idea that either party may abandon that commitment for any reason without consequence. The presumption is, I think, a fiction premised on the need to encourage forms of cooperation within marriage that make sense. Can we really act as if those forms of cooperation can be unentangled without fault? Dissolution inevitably deprives someone of the benefit of their bargain. 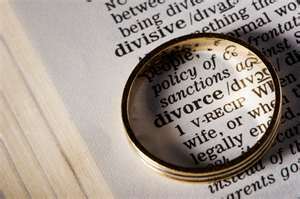 Can that really be divorced from the reason for dissolution? These questions are not rhetorical. I don’t know. I have to agree with Nick’s comment here. People should be able to choose what direction they want their lives to take without the intervention of the government. If couples choose to divorce, they should be able to make that choice without push back from any governing body.